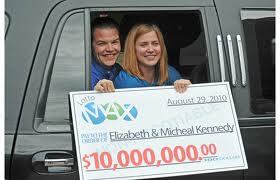 Some lucky winner in Ontario won the $20 million of Friday’s Lotto Max. On the other hand, the $32 million of Saturday’s 6/49 went without a winning ticket and so has been carried over to this coming Wednesday with an even bigger jackpot of $40 million! It’s a lazy Sunday. Time to catch on the news, mull over the coming week and plan out what to do for the rest of the month of July. Hey race fans! Check out the Indy races going on today down at Exhibition Place. Go to the official web site for tickets. This is the opportunity to get up close and personal with the action right in Toronto; no watching this on television. The schedule of events details everything you can possibly do during the event. If your thing is high powered cars, this is the place to be this weekend. On Friday, I was out there for the first showing of Horrible Bosses. It’s not bad; certainly not a clear winner but not bad. Here are my other recommendations for those who can’t make up their minds. Beginners proves you don’t have to spend hundreds of millions of dollars to make a good film. Of course getting somebody like Christopher Plummer to charm us makes the day. Larry Crowne: Tom, Tom, yes you snagged Julia Roberts to star with you but you didn’t snag a great script. Transformers: Dark of the Moon is a loud, in your face special effects extravaganza. Rotten Tomatoes rates it at 37% but it’s making a zillion at the box office. The Tree of Life is an art film; good but a bit long. Green Lantern, what can I say? $200 million and I wonder if the movie studio will ever dig its way out of the red. Bridesmaids turned out to be a heck of a lot better than I was thinking; I was actually surprised and would now say if you’re in the mood for a romantic comedy with some gross-out laughs, check this out. Super 8 was a well done action mystery centered on a bunch of kids in the tradition of Spielberg (who produced). Kung Fu Panda 2 is just quite simply some great family entertainment. Take your kids but enjoy it yourself. Midnight in Paris is a wonderful adult film with Paris as the backdrop and oh what a backdrop it is. I thoroughly enjoyed this Woody Allen film and you will too. X-Men: First Class is a good film and an excellent reboot of the series. It’s a prequel with a whole new cast but well done with a good story. Also, for those who are film aficionados, check out “Movie Previews: 2nd Half of July 2011” for a preview of a few films opening in the next two weeks. This festival, running from July 6 to 17, brings to the public eye the offbeat and the weird. Check out the official web site for a rundown of the various shows, times and tickets. Don’t forget Toronto offers food and lots of it. Summerlicious is in full swing and this is your chance to try out a new restaurant. Let’s not forget that if you tried to visit every single restaurant in Toronto, you’d be at it for years. Yes, there are that many eating establishments in this city which adds up to choice. The prix fixe is the time to try something new without blowing your entire pocketbook so have a look at something new. Toronto has a lot, and I mean a lot, of great places to eat. * Caribana is North America’s largest street festival, showcasing Caribbean/West Indian culture (in some years early August). * Corso Italia – Italian Street Festival on St Clair West. * http://rushcon.totem-media.com/ RushCon – North America’s largest Rush fan convention. * Loyal Orange Lodge Parade. The oldest continuous parade in North America. * The Canadian National Exhibition (CNE, or “the Ex”). * The Taste of the Danforth festival showcases the mostly Greek culture of The Danforth and has expanded to include other cultures of the area. * The Mabuhay Philippines Toronto Summer Festival- the largest celebration of Philippine heritage and culture in Canada. * Festival of South Asia – A festival of the South Asian culture of Gerrard India Baazaar. * Muslim Fest- Festival Celebrating the Best in Muslim Art & Entertainment – Annual Festival Celebrating the Best in Muslim Art & Entertainment. * Toronto Buskerfest- A festival of Street Performers. * Taiwanfest previously known as TCF (Taiwanese Cultural Festival). * Toronto’s Festival of Beer- Toronto Beerfest in Historic Fort York. * Markland Wood Annual Family Fun Day is held on the second Saturday in August, celebrating summer with clowns, The Toronto Police and Firefighters, games, face painting and lunch. StarPulse reports on the California leg of their North American tour. July 8: The couple will arrive from Canada and go to the UKTI reception at the Beverly Hilton. They will then head over to the Consular General’s LA home for a high-profile meet-and-greet with politicians and VIPs. July 9: They will head to Santa Barbara for a polo match benefiting American Friends of the Foundation of Prince William and Prince Harry. William will play polo and they will both be handing out prizes. That night, they will attend the BAFTA reception at the Belasco Theatre and plan to walk the red carpet at the star-studded event. Prince William is the president of BAFTA and will make a short speech. July 10: They will visit Inner City Arts in Los Angeles, which is a program that helps homeless and disadvantaged children. Their evening plans include attending a war veterans event at Sony Studios that helps strengthen the bond between UK and US armed forces.